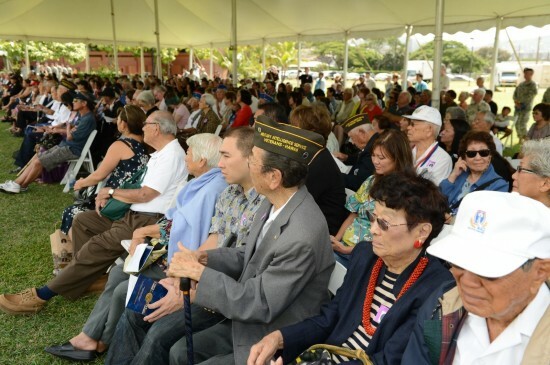 “American Heroes: World War II Nisei Soldiers and the Congressional Gold Medal” opened March 9 at the Bernice Pauahi Bishop Museum in Honolulu. 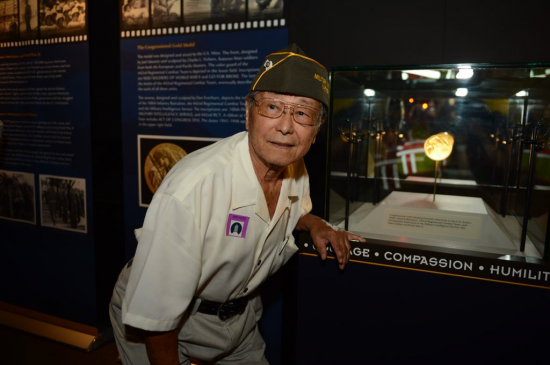 The medal, awarded to the Army’s Nisei units of World War II in 2011, and an accompanying exhibition are on a national tour that began in New Orleans and will be on view in Hawaii until April 14. Above: The 100th Battalion, 442ndInfantry, U.S. Army Reserve, presented, posted and retired the colors. 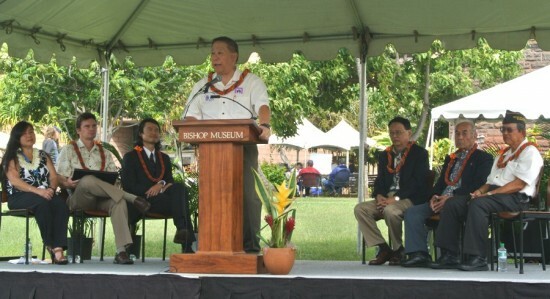 Speakers at the opening ceremony included (from left) Jeanne C. Ishikawa, deputy director, Parks and Recreation, Honolulu City and County; Blair D. Collis, president and CEO, Bishop Museum; Konrad Ng, director, Smithsonian Asian Pacific American Center; Howard Sugai, lieutenant colonel, U.S. Army Reserve (retired), former executive officer, 100th Battalion, 442d Infantry; Lloyd Kitaoka, president, 100th Infantry Battalion Veterans Club; William Thompson, president, 442nd Veterans Club; George Arine, president, Military Intelligence Service Veterans Club of Hawaii. 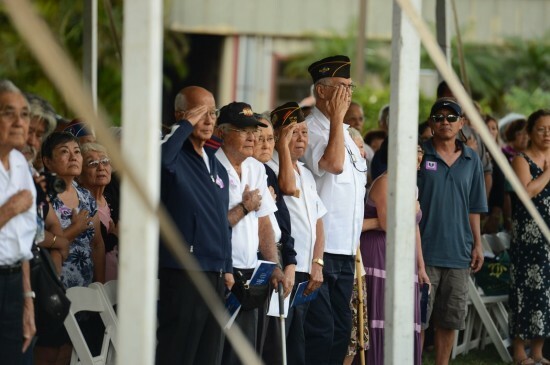 Veterans of the 100th, 442nd and MIS attended along with their families and friends. 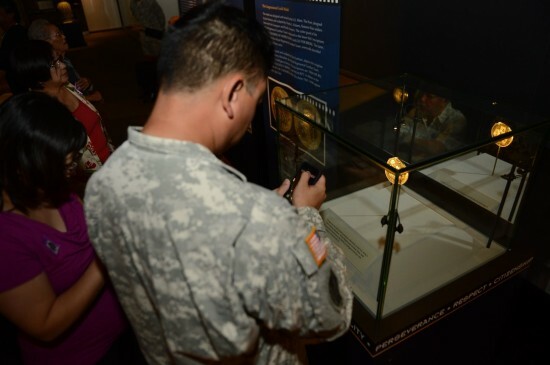 Visitors took pictures of — and had their pictures taken with — the Congressional Gold Medal. 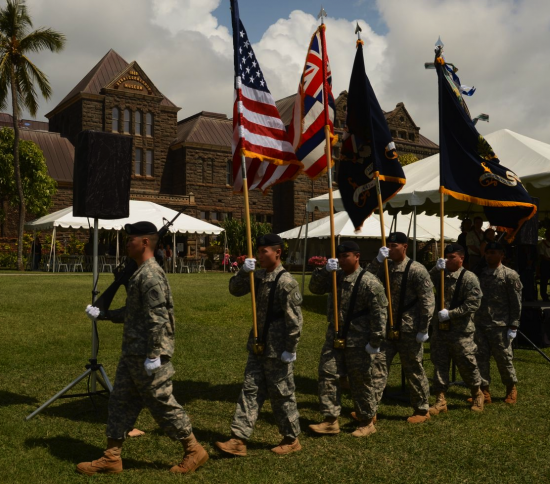 Left: Maj. Gen. Robert G.F. Lee (retired), former adjutant general of Hawaii, was the keynote speaker. Right: Konrad Ng, director of the Smithsonian Asian Pacific American Center (and President Obama’s brother-in-law), and Blair Collis, president and CEO of Bishop Museum, with an image of the medal. 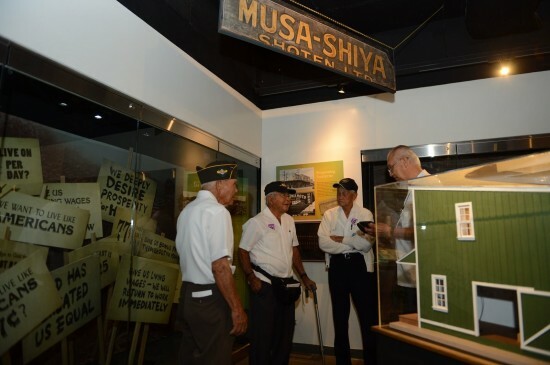 Veterans visit an exhibit about the Japanese American experience in Hawaii. Panelists discussing Hawaii’s “political war” after World War II included (from left) former Gov. George Ariyoshi, retired Chief Judge James Burns, former Gov. Ben Cayetano, and Aina Haina Elementary School Principal Brendan Burns. They talked about the legacy of the late Gov. John Burns (James’ father and Brendan’s grandfather), who worked with the Nisei veterans to achieve statehood for Hawaii. Ariyoshi, Burns’ lieutenant governor, became the nation’s first Japanese American governor.